Plastic cover with a wraparound sleeve. reverse of the sleeve is blank. All songs published by Kobalt Music. 'Everyday' contains a sample of "I'm Counting On You" performed by Petula Clark and written by Alicia Evelyn. Published by Schroeder Music Publishing / Universal Music Publishing. (P) 2012 Wichita Recordings Ltd., under exclusive license from Simian Mobile Disco. 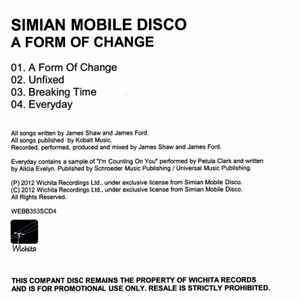 (C) 2012 Wichita Recordings Ltd., under exclusive license from Simian Mobile Disco. "COMPANT DISC", printed with "N" instead of "C" on sleeve.